The 1922 discovery by Howard Carter and George Herbert, 5th Earl of Carnarvon of Tutankhamun's nearly intact tomb received worldwide press coverage. 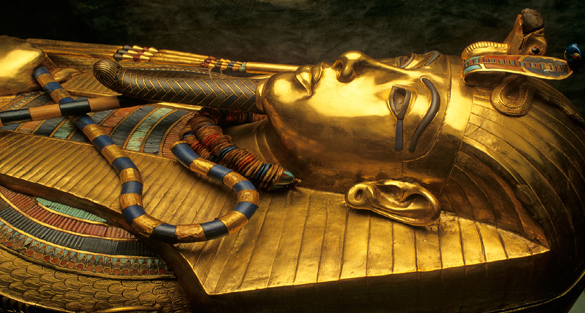 It sparked a renewed public interest in ancient Egypt, for which Tutankhamun's burial mask remains the popular symbol. Exhibits of artifacts from his tomb have toured the world. In February 2010, the results of DNA tests confirmed that he was the son of Akhenaten and Akhenaten's sister and wife, whose name is unknown but whose remains are positively identified as "The Younger Lady"
Tutankhamun was the son of Akhenaten (formerly Amenhotep IV) and one of Akhenaten's sisters, or perhaps one of his cousins. As a prince he was known as Tutankhaten. He ascended to the throne in 1333 BC, at the age of nine or ten, taking the throne name of Tutankhamun. His wet-nurse was a woman called Maia, known from her tomb at Saqqara. When he became king, he married his half-sister, Ankhesenpaaten, who later changed her name to Ankhesenamun. They had two daughters, both stillborn. Computed tomography studies released in 2011 revealed that one daughter died at 5–6 months of pregnancy and the other at 9 months of pregnancy. No evidence was found in either mummy of congenital anomalies or an apparent cause of death. Given his age, the king probably had very powerful advisers, presumably including General Horemheb, the Vizier Ay, and Maya, the "Overseer of the Treasury". Horemheb records that the king appointed him "lord of the land" as hereditary prince to maintain law. He also noted his ability to calm the young king when his temper flared.